Science is the key to all the mysteries of the world. The modern world would not be modern at all without the understandings and technology enabled by Science. It has provided mankind remarkable insights into the world and universe around us. It continues to develop and shape our lives for a better tomorrow. 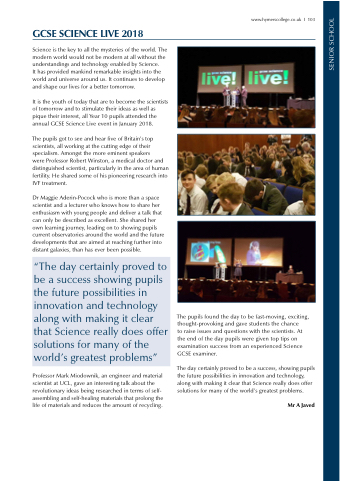 It is the youth of today that are to become the scientists of tomorrow and to stimulate their ideas as well as pique their interest, all Year 10 pupils attended the annual GCSE Science Live event in January 2018.
were Professor Robert Winston, a medical doctor and distinguished scientist, particularly in the area of human fertility. He shared some of his pioneering research into IVF treatment. Dr Maggie Aderin-Pocock who is more than a space scientist and a lecturer who knows how to share her enthusiasm with young people and deliver a talk that can only be described as excellent. She shared her own learning journey, leading on to showing pupils current observatories around the world and the future developments that are aimed at reaching further into distant galaxies, than has ever been possible. Professor Mark Miodownik, an engineer and material scientist at UCL, gave an interesting talk about the revolutionary ideas being researched in terms of self- assembling and self-healing materials that prolong the life of materials and reduces the amount of recycling. to raise issues and questions with the scientists. At the end of the day pupils were given top tips on examination success from an experienced Science GCSE examiner. The day certainly proved to be a success, showing pupils the future possibilities in innovation and technology, along with making it clear that Science really does offer solutions for many of the world’s greatest problems.